First I need to start off by saying Thank you to an anonymous donor who supported my Donor's Choose project. I came home from ESY today to an email saying I had a new donation. This totally turned a not so good day around! Huge Thank yous!! Question for all my readers.... how do you "advertise" your Donor's Choose Projects? So as I have said before our theme for ESY is Pirates. We like to do cooking with the kids since it is something not all of them get to do during the school year. Yesterday we made sand. It is a lot like dirt, just a different color. First the kids crush up vanilla wafer cookies. We put them in a plastic bag and have the kids pound on them. Some of the kids hit it with a spatula. Of course, I forgot to take a picture of this part. My wonderful co-teacher reminded me after by saying, "Hey, don't you want to take pictures for your blog!" Next, we made vanilla pudding. Then we folded the cookies into the pudding. 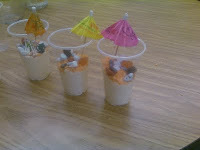 We also put some pudding on the bottom of the cups we were using for a layered effect. 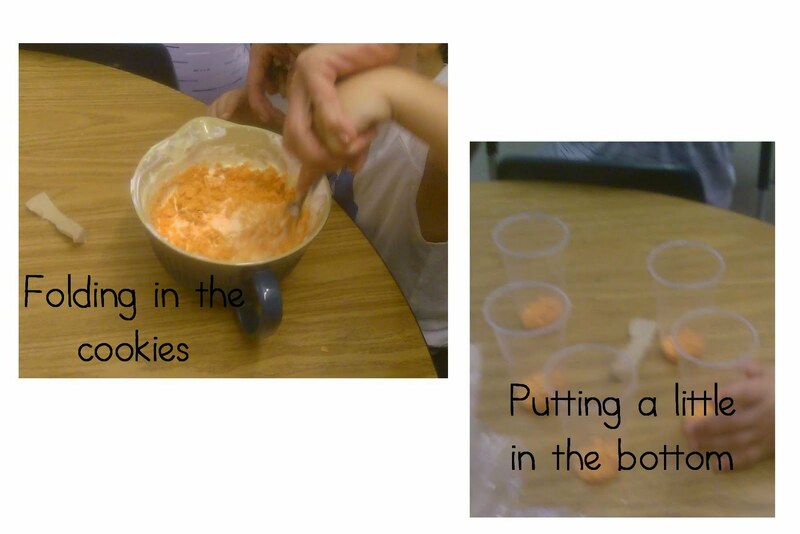 We then put the mixture into cups and topped with a bit more of the cookies. Each cup then got an umbrella, some rocks (check out my beach walk post for info on these) and some fish gummies. The kids loved making and eating this. They also delivered it to various people in the building. I stressed when we were delivering that we ALWAYS wash our hands before beginning to cook. I also wanted to mention that I am planning on having a giveaway when I reach 50 followers. I am so impressed when I log on a see I added another follower. I can't believe it!!! Caitlin I have to do Alternate assessments for my students in place of the state achievement test.. this blog "Making Sand" gave me another excellent idea to use as one of our possible assessments! Thank you!